The Silver State Flour Mill is located in Paradise Valley, Nev.
Like many people in western Nevada, I have a few choice pieces of antique yard art at my home to remind me of the rich, cultural heritage of our area. Some people have a weathered wagon wheel or perhaps a rusty old mine car once used to carry ore out of the mines. Because my family and I came from an agricultural background, my favorite piece of antique yard art is a millstone from the first water-powered flour mill constructed in Paradise Valley in 1867. For many years, my late uncle, Robert Cassinelli, owned and operated the Old Mill Ranch just north of Paradise Valley along Martin Creek in Humboldt County. In the 1860s, this ranch became one of the leading producers of wheat and flour in the state of Nevada. At that time, flour and other grain products were in great demand on the Comstock and in the other mining districts around the state. 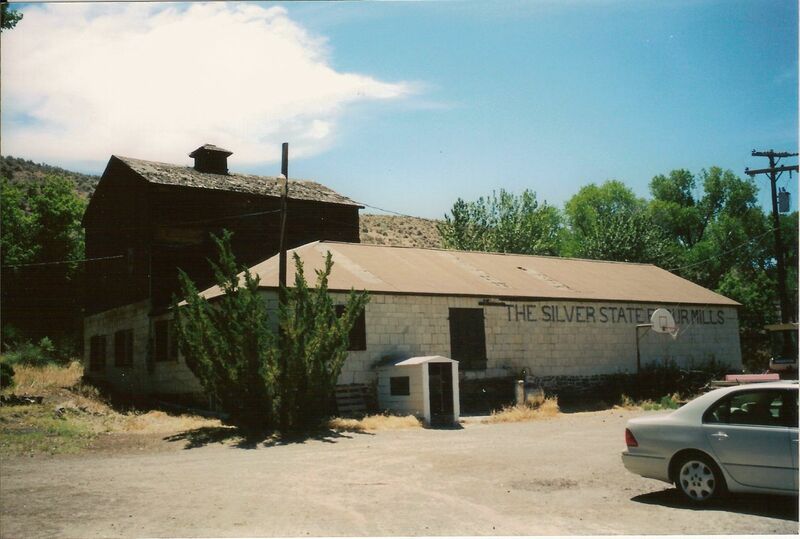 This is how the old flour mill at the ranch got the name “Silver State Flour Mill.” The mill is still standing today, and it contains all the old milling equipment waiting for the day when it may produce flour once again. The original 1867 mill built by C.A. Adams was located in the house where my aunt, Jean, now lives. The millstone I have came from that mill. 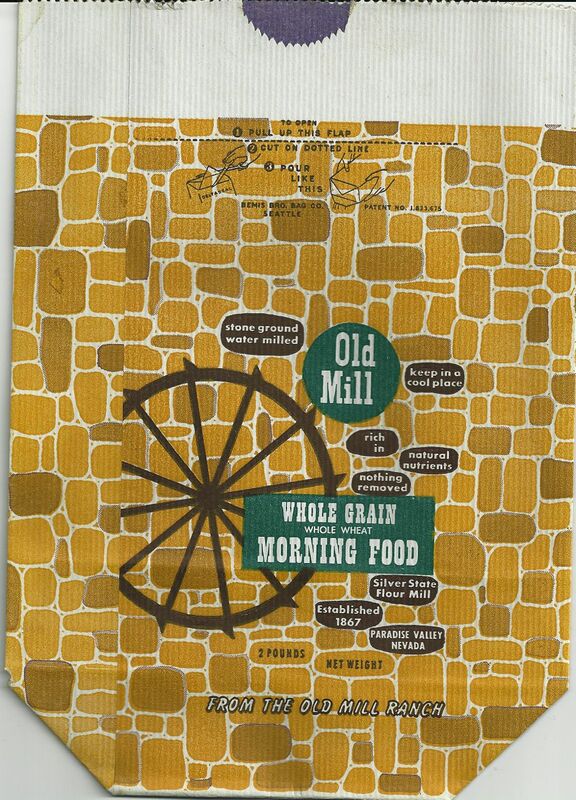 Prior to construction of the mill, flour was made by grinding the wheat in a coffee grinder. The Silver State Flour Mill, where the water turbine and milling equipment are located, was built in the 1870s and is adjacent to the older structure. Robert gave the millstone to me more than 30 years ago when I was at the ranch on a hunting trip. It was used to grind flour in the first flour mill built in the valley in 1867. It weighs about 500 pounds. The ranch is still operated by Robert’s son, Dan Cassinelli. An unused sack from the Silver State Flour Mill. Water for operating the flour mill came from a diversion dam on Martin creek where the water flowed down a ditch to the mill. There, it was diverted into the turbine that turned the milling machinery. The belts that connected the pulleys to the various grinding machines were made from wide strips of leather. Paradise Valley is a wonderful scenic area of farms and ranches. There is great fishing and hunting in the valley and the surrounding mountains. The town of Paradise Valley is like a picture postcard of the Wild West. Just north of town is Hinkey Summit and ruins of the old mining camp of Spring City. My family still runs cattle in the hills around the valley and combs the hills on horseback every fall to bring the cattle back to the ranch for the winter. Many of the old buildings in Paradise Valley and the surrounding ranches were constructed of sandstone cut from a quarry east of the valley. Others were built of granite blocks, which occur naturally in outcroppings on the farms and ranches. They were built by Italian stonemasons who settled in the valley in the 1860s and 1870s. The Silver State Flour Mill is constructed from the smooth-cut sandstone. At the mouth of Martin Creek, where it opens up into Paradise Valley, is a small campground near the ruins of another small mining camp called Queen City. About a mile upstream from the campground are the ruins of a large stone dam constructed by Chinese laborers in the 1860s to provide water to the Queen City Mills. This is still called the China Dam. The Paiute Indians called Paradise Valley Yamosopo, which meant “Half Moon Valley.” When white settlers first entered the valley in the early 1860s, the Indians became very hostile because the whites were threatening to take over one of the most productive areas for game and food gathering available to them. Between 1864 and 1867, there were many bloody skirmishes between the whites and the Indians. Fort Winfield Scott was built at the north end of the valley in an effort to protect the settlers from harm. Despite this, there were many Indian raids, and hundreds of people died before things settled down about 1867 when the Silver State Flour Mill was constructed. Paradise Valley remains one of the most pleasant of all ghost towns to visit in the American West. Don’t expect to see tourist traps and junk shops — just an authentic, unpretentious old western town surrounded by active ranches, historical sites and spectacular scenery. This entry was posted in American West, History and tagged Paradise Valley Nevada, Silver State Flour Mill by Dennis Cassinelli. Bookmark the permalink. I didn’t know you had this site up. Looks great and a great resource.